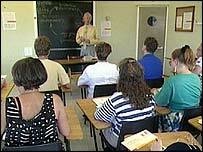 There are fewer adults taking part in education in the UK than there were last year, a survey suggests. A poll of 5,026 people indicated a drop in participation from 42% to 41%. The National Institute of Adult Continuing Education claimed this meant 500,000 fewer adult learners - though statistically the change is negligible. It blames a "rebalancing of public provision" in England. The government says it has spent more and prioritised the "most beneficial learning". The survey is carried out by Niace every year ahead of its Adult Learners' Week, and has shown little change over the past decade. It suggested that, as in previous years, one in three adults had taken no courses since leaving full-time education. And no significant progress had been made to encourage those who left school earliest or those who are the poorest to go back to class. The proportion of less well-off people on adult education courses (27%) is about half that of middle-class people (55%). However, more retired people are studying. The proportion has risen by three percentage points from 16% last year to 19% this year. And the number of over-75s engaged in learning has risen five percentage points to 15%, according to the poll. These figures come at a time when the Learning and Skills Council in England reports there has been a reduction of almost one million adult learners. At the same time Wales is reporting a modest rise in overall participation, Niace said. Report author and director of Niace Alan Tuckett said many of the new older learners were taking advantage of self-study opportunities on the internet and in the private sector. "Many of the people now taking part in self-organised language groups, or discussion circles are refugees from classes lost in the re-balancing of public provision. "They know learning is a good thing, and in the absence of a public offer, decide to sort it out for themselves." He said this was all well and good for those with the confidence to do this but questioned where "potential new learners seeking to put their toes in the water of adult education" would go. Figures from the survey also suggested a fall from 51% to 49% among full-time workers participating in learning and from 55% to 47% among part-time workers. This would be disappointing for the government, Mr Tuckett said, as increasing work-place learning was one of its key goals. "The government is keen to rebalance learning to make sure people in the workforce learn. So something isn't going right with public policy. However, he said the message was not all bad with a "significant" rise over 10 years in the number intending to take up learning in the future. England's Higher and Further Education Minister Bill Rammell said: "We are not cutting adult education, in fact we have increased investment to FE by 48% in real terms in the last decade, and spending is still rising." He said what they were doing was prioritising the "most beneficial learning", such as longer courses with more chance to progress, and more people in work-based learning. "We have to do this to face up to the need to increase significantly the numbers in work with skills to be competitive," he said. The poll results are released ahead of Adult Learners' Week, 19 to 25 May, during which hundreds of free taster courses and learning events are being organised.